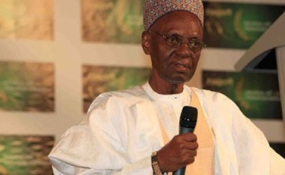 Former President Shehu Shagari has died at the age of 93. He died yesterday at the National Hospital, Abuja. His grandson, Nuradeen Mahe, told newsmen in Sokoto that the late president died at 6:40pm and that his remains would be flown to Sokoto for burial today according to Islamic rites. Mahe said Shagari was transported to Abuja on December 25 when his health deteriorated. Shagari was Nigeria's president from 1979 to 1983 and won re-election before being overthrown in a coup d'etat which brought in Major General Muhammadu Buhari as military head of state. The late president was born February 25, 1925 in Shagari, Sokoto State. In 1954, he was elected to the House of Representatives. He served seven times in ministerial or cabinet positions as a federal minister and federal commissioner from 1958-1975, before he was elected president in 1979. He won a disputed re-election in 1983 that accelerated a military coup three months later after he was sworn in and the economy was on a precipitous decline. Though, there was no official confirmation as to when and where he would be buried at the time of filing this report, a source however from within the Sokoto state government cycle confided in LEADERSHIP Weekend that his remains would be buried according to Islamic rites in Sokoto today. President Muhammadu Buhari has expressed great sadness at the news of the passing away of former President Shehu Shagari. President Buhari's message was contained in a statement by his special adviser on media and publicity, Femi Adesina, which was made available to journalists yesterday in Abuja. President Buhari said, "On behalf of my family, the government and the people of Nigeria, it is with immense sadness that I received the news of the passing away of the First Executive President of Nigeria, Alhaji Shehu Shagari which event happened on Friday in Abuja." Buhari, however, expressed gratitude to God that Shagari lived to a ripe age and led an exemplary life, which he urged Nigerians of all walks of life to emulate. "Nigerians held him in the highest esteem even when he was out of office until his demise and will forever miss his wise counsel," he said. He prayed that Almighty God comfort the family of the ex-president and all those who mourn him, and for God to grant his soul eternal rest. IBB, in a statement he signed personally and made available to journalists in Minna, said: " With deep heart and sympathies I wish to express my heartfelt condolences to the family of the first civilian Executive President of the Federal Republic of Nigeria and the Turakin Sokoto, Alhaji Shehu Usman Aliyu Shagari, GCFR, who passed on today (yesterday) at the National Hospital after protracted illness." "My heart and prayers go to his family, the government and people of the Federal Republic of Nigeria, the Sokoto Caliphate and Sokoto State. "Nigeria and indeed Africa has lost a statesman and democrat whose wisdom, counsel, presence and experience and his sterling qualities of honesty and transparency are needed in these very trying moments of our national life. President Shehu Shagari was a great patriotic leader and an accomplished gentleman, at first a teacher, an administrator, a technocrat and an honest, decent unassuming simple Nigerian leader." IBB noted that to keep his memory alive Nigerian politicians and indeed all fellow Nigerians must put to practice all his ideals of peace and party politics without rancour, irrespective of any form of provocation.
" I urge all persons vying for political office to emulate him and keep alive the political principles of the late Turakin Sokoto, Shehu Usman Aliyu Shagari, the quintessential public servant who was "Beckoned to Serve"." He, therefore, prayed for the peaceful repose of Shagari's soul. Former President Goodluck Jonathan has condoled with the family of Alhaji Shehu Shagari and the people of Sokoto State over the demise of the nation's Second Republic president, describing him as a nation builder who cemented a good relationship between the North and South. In a statement by Ikechukwu Eze, the former president's spokesman, Jonathan further described Shagari as a nice man with a clean heart who was sincere and selfless in service. He said, "The late President Shagari was a very nice man with a clean heart. As a President he was humble, sincere and selfless in service. "He will be remembered as a teacher, parliamentarian and President whose model of service was anchored on diligence, broad-mindedness and humility." On his part, Senate President Bukola Saraki has mourned the late Shagari, describing him as the last of the First and Second Republics titans. He also commiserated with the immediate and larger family of the deceased, the government and people of Sokoto State, and the entire country over the loss of the former president. He stated: "Let's be consoled by the fact that Alhaji Shagari lived his life in the service of God and country. "My family and I join the entire nation to mourn the passing of former President Shehu Shagari, who led our nation during the Second Republic. He was a quintessential public servant; having served in seven cabinet positions and as a legislator. He was the first elected president who was chief executive of the country. He dedicated his best years in the service of our nation and its people and will be dearly missed. He prayed Allah to grant the soul of the late former president a place among the righteous ones in Aljannah Firdaus and to grant his family, loved ones and the entire country the fortitude to bear the irreparable loss. For his part, the governor of Jigawa State, Alhaji Muhammed Badaru Abubakar has condoled with President Muhammadu Buhari, the Sultan of Sokoto, the people of Nigeria and the entire Muslim Umma on the passing away of former President Shagari. Governor Abubakar' s condolence message was contained in a statement by his media aide, Bello Muhammad Zaki. The governor, in a statement by his chief press secretary, Petra Akinti Onyegbule said he received the news of the death of the former president with a deep sense of sadness. Governor Bello described the former president as a man of deep wisdom who lived a quiet life of nation building decades after leaving office bearing no grudge and never caught making unguarded statement that threatened the stability of the country nor cast aspersion over successive leadership of the country. On his part, the Emir of Ilorin, Alhaji Ibrahim Sulu-Gambari, has commiserated with the Sultan of Sokoto, Alhaji Muhammadu Sa'ad Abubakar, over the death of former President Shehu Shagari. In his condolence message to the Sultanate Council issued yesterday by the National Secretary of Shehu Alimi Foundation for Peace and Development, Mallam Abdulazeez Arowona, the Emir described Shagari's death as a great loss to humanity. The monarch also condoled with the Sultanate Council, government and people of Sokoto State and the entire Nigerians over Shagari's demise. He, however, urged Sultan Saad Abubakar to find solace in the fact that the deceased, who was until his death the Turakin Sokoto, lived a fulfilled life worthy of emulation. Immediate past governor of Sokoto State and chairman, Northern Senators Forum, Senator Aliyu Wamakko, has described the late Shehu Shagari as a pius elder statesman whose love for the nation remained a reference point. Wamako, while reacting to the news of the death of the nation's Second Republic president in a telephone interview, said that Shagari will be missed not only by the state and Nigeria but the global community as well. "The death of Shehu Aliyu Shagari is a great loss not only to Sokoto state but Nigeria as a whole. His memory will never be erased from the nations history. "Shagari, while alive, lived an exemplary and pious life. He was until his death a true leader who would not be forgotten in any centuries to come. "He contributed immensely to Nigeria's independence and brought a lot of development to the nation and will forever be remembered within and outside Nigeria," Wamakko said. The Arewa Consultative Forum (ACF) has described the late Shehu Shagari as a symbol of peace and unity. In a statement by its national publicity secretary, Muhammad Ibrahim Biu, yesterday, the ACF said the late Turakin Sokoto not only engraved his name in the annals of Nigerian history as an elder statesman but also rendered selfless service to the North and Nigeria. The forum said Nigeria has lost a great leader and a stabilizing personality whose wisdom had greatly influenced the nation's polity. The forum said the best way to remember Shagari is for those of us whom he has left behind to live up his legacies by way of promoting national ideals, moral values and respect for sacred core of inviolability of the individual. The bishop of the Catholic Diocese of Sokoto, Most Rev. Matthew Hassan Kukah, has commiserated with President Muhammadu Buhari, the people of Sokoto state and Shagari's family over his death. Kukah described the passing away of Shagari as one that marks a major milestone in the life of Nigeria as a country. "The late former president was a committed patriot, dedicated to the building of a peaceful and democratic Nigeria. "In his pursuit for dialogue, he was the first Nigerian leader to invite the Pope to visit our country in 1982, thus, laying the moral foundation for his Ethical Revolution," Kukah said. The death of former president, Shehu Shagari is a great loss not only to the people of Sokoto State but all Nigerians because he was a real democrat, former governor, Attahiru Dalhatu Bafarawa said. Speaking through his media aide, Ibrahim Dingyadi, Bafarawa said, "Shagari lived his life to ensure the unity and political stability of Nigeria and Africa as a whole. The role he played towards the independence of Zimbabwe amongst others made him a nationalist per excellence."